Meet other local artists, find inspiration, motivation, and new friends! There will be a skill share and guest artist presentation at most meetups. Artist Meetups will be every other month and rotate locations. 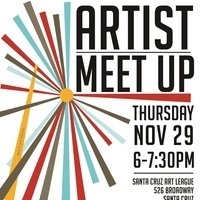 November's meetup is at the Santa Cruz Art League. Parking is very limited so please carpool or take alternative transportation! Drinks and Snacks provide. $5 suggested dontation at the door to help cover snack and drink costs.